Organizations in the 21st century have grown increasingly risk averse, causing many people inside them to take a defensive view of the world. Small wonder that collaboration – the open exchange of ideas in an effort to solve problems – has a grown increasingly difficult. More and more we hear about collaboration and it’s benefits, via sage advice from outsiders and edicts from above. But there’s a simple question facing us. It often goes unasked and stays unanswered. Do we have the courage to collaborate? On Friday April 26th, at the Chesapeake Bay OD Network (CBODN) 2013 Annual Conference, from 1-2:15 pm, James Alexandar and I are taking on this topic. The conference theme is “Courageous Leadership” and it explores how OD practitioners must challenge what we think we know about achieving success in the 21st century organization. I’m Chris Jones, @sourcepov from Twitter, and I’ll be heading up from Charlotte to join in the conversation. James and I will explore a variety of the key elements in the equation, but ultimately we’ll focus in on Culture, lack of Trust and Fear. These elements invariably shape and constrain behaviors in today’s organizations, in spite of efforts in the opposite direction. Most of the time, the odds seem stacked against us. The ability to take on the challenges requires an immense amount of courage. Success requires leaders who are willing and able to release their death grip on control. The discussion on Friday will explore some core precepts of OD, then tackle the implications of key barriers. Then we’ll share some very specific insights on how collaboration accelerates in a high-trust, low-fear workplace, giving participants hands on experience with collaboration in an open exchange. 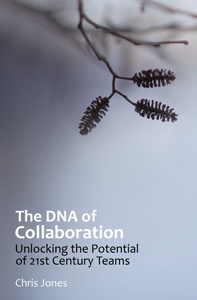 We’ll navigate from a “risk averse” mindset to a “risk-enabled” one, tapping ideas from my book The DNA of Collaboration: Unlocking the Potential of 21st Century Teams. Many connect the pursuit of critical thinking to the behavior of a group of stakeholders that I’ve come to call contrarians but we need to tread carefully on the semantics. There’s a valuable role for challenging assumptions, taking an alternative view, even a healthy debate. Those who help drive such thinking I call ‘challengers’. It’s a key role that I outline in Ch.14. Contrast all that with the dynamic in unhealthy debates. These are, sadly, all too common. Q1 How do respect and healthy boundaries influence our ability to collaborate? Q2 Broadcasting, talking over others and controlling the floor spell trouble. What can be done? Q3 When emotions rise, we stop thinking clearly .. have you seen this happen? What do you do about it? Q4 Arranging for up-front Opt-in to rules & participation changes the mix. Is self-selection a game changer? We’ll discuss this today at 11am ET at Twitter hashtag #cdna. I hope you’ll join us!